Just received this very cool ad from Warren Friedrich. 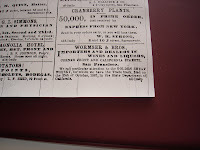 Portland Morning Oregonian March thru July 1868. 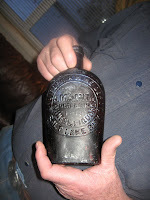 Check out the bottle Wormser Bros. were using in early 1868. Looks like the wide body to me. Wormser(tf-62) The only thing that would be better would be to show the bottle with a "champange top". Hildburgh Bros. knew how to pick the brands for their agency. What, a flask or square bottle doesn't interest you, how about some of these new grape brandy bitters in the unusual, funny looking bottle. I love that Alex von Humboldt's ad. "One wine-glass full taken three times a day, before meals" That is a lot of stomach bitters!! Say a wineglass is 12 oz, not a sherry glass but a wine glass. If you are pouring your own at home, I don't think your going to scrimp with an 6 - 8oz. serving. Say we split the diff. and say 10oz. That's 30 oz. a day, or more than a fifth per day. I just had to measure my Alex Von Humboldts and it holds 22oz at just below the top. Hell, that is a 1.3 bottles per day!! I need to find someone that was hooked on Alex. back in 1868. Wouldn't take too long to fill a privy with bottles at that rate. Finally!!! 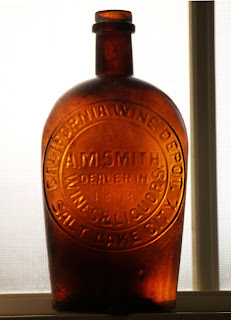 Some 40 years after the first broken pieces of the A.M Smith California Wine Depot flask were first discovered or at least identified, an intact example has surfaced. This bottle has been long sought after by collectors of Utah bottles and then by an even broader group of western whiskey flask collectors. It has been an elusive little bugger! After Blackie Owen found and identified the first broken one in Jan. 1968, there had only been 5 or 6 other confirmed finds, all broken. There is a big story here, but I need to leave that to the new owner -- Ralph Van Brocklin. He is a much better writer than I and as soon as his feet touch ground again, I hope he will get that story off to the Federation's BOTTLES and EXTRAS. Ralph sent me a couple of pictures... Look at those curved leg "R's"
Anyone looking for a labeled, glob top Phoenix. Nice display of them at the Industrial Exposition. 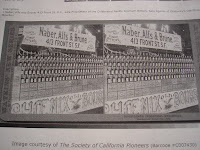 Naber, Alfs, & Brune put this booth together in 1879. Some additional information that you may find interesting on Wormser Bros. Their popular brand Golden Sheaf Whiskey was granted a trademark in the "State of California" on Oct. 24th, 1867. As has been noted in other publications the colored, circular label portrays a women in a wheat field holding a sheaf of wheat. 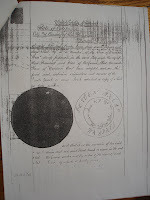 Very similar to the proposed trademark in the application with the state. I have seen at least two of the Wormser Bros. (tf-63) flasks over the years that have been dug with the label remaining intact. The late Charlie Frates had an example with a complete label that was found high in the mountains in the area around Ely, Nevada. This area is routinely under snow for 5 to 6 months a year. Interesting that labels on bottles and cans survive in this environment. Warren Friedrich has been doing a tremendous amount of research on western bottle manufacture and western glass works history sent me this interesting advertisement that appeared in the Sacramento Daily Union for a full month beginning on Nov. 5th 1867. Apparently Wormser Bros. were quite proud of the Golden Sheaf brand. For many years, there has been much conjecture as to where particular western bottles may have been blown. The Pacific Glass Works or possibly it's competitor the San Francisco Glass Works. Bottles that are known to have been distributed during this 1867 to 1870 period had been the focal point of Friedrich's research because there was that obvious gap in production at San Francisco Glass Works. (Burned down in Jul. 1868, production restarted Sept. 1870) Bottles that were distributed in 1869 -1870 had to be blown at Pacific Glass Works... right? Well, not so fast.... it's not quite that easy. 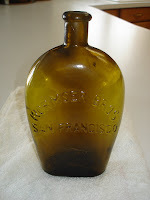 Friedrich has uncovered some fascinating information on bottle manufacture, mold making and mold ownership, and some completely new and fresh information on some of the rarest western blown bottles. I'll let him tell you about it in the book he is writing. It is great stuff!! As far as Wormser Bros., the (tf-62) horizontal seems to disappear about the same time as the S.F. Glass Works burns down. The (tf-63) vertical is definitely around in 1869 so maybe the Wormser brothers were Pacific Glass Works clients from the beginning. I have not found any other brands that the Wormser Bros. have trade marks granted for. However, just recently an interesting bottle was found wrapped or enclosed in a leather case. It was the Wormser vert(tf-63) and the label was preserved perfectly. Not a Golden Sheaf label, but EUREKA WHISKEY - PUT UP BY WORMSER BROS. S.F. Check it out at this link. Very interesting. www.fohbc.com/PDF_Files/WesternFlasks_Fa2005.pdf. I have no additional information on this Eureka Whiskey brand. If anything new has turned up, type us a comment. The Wormser flask with the large top pictured in my first post, is not a real extreme example of this variant. I have seen a number that are much more pronounced. The test to determine if you have this "large top" variant is quite simple. It was devised a number of years ago at the Reno Bottle Show by my friend and flask collector Jon Lawson. Simply turn the bottle upside down and stand it on it's top. RELEASE YOUR HAND!! The release time is the critical element in determining the "rating" assigned to your specimen. A top example might have a release time of .5 seconds or less! If you are showing your bottle at a location with a cement floor, please add at least 2.5 seconds or an appropriate amount of additional time to the experiment. Being in a modestly sober condition is also quite important. The early glob top whiskies have been highly sought after ever since it was noticed that they were different in many ways to the majority of whiskey bottles found by diggers and collectors. With several books as guides, many new collectors started to focus exclusively on these older style whiskies and the dollar value of the older bottles began rise dramatically. Early on it may have been possible to "cherry pick" a couple of very nice older globs from a novice collector or digger that had a put together a sizable collection of assorted bottles. As more and more collectors and dealers combed the western states, the chance of finding a "pilgrim", or picking up a nice bottle from the uninformed became more remote. By the early 1970's, bottle shows and dealer listings became the way to acquire the bottles you were looking for. The annual Reno Bottle Show became one of the top attractions for collectors of glob top whiskey bottles. Located close to the famous mining towns of Virginia City and Gold Hill, many of the very rare old whiskey bottles were bought, sold or traded at this venue. Las Vegas was another great show for acquiring the good old whiskies. All of the California bottle shows had good whiskey bottles. 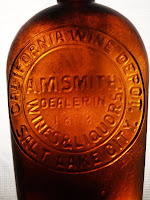 These shows were usually not quite as large as Reno or Vegas, but diggers in northern California found large number of the known examples of these old whiskey bottles. Astute collectors and dealers loved to set up their sales tables close to the entrance into the bottle show, maybe hoping for the opportunity of being the first person to see and purchase a recently dug bottle. These were the early days of being a whiskey collector in the west. By the 1980's it had become more difficult to locate good whiskey bottles at shows. Very few of the really good bottles ever showed up on the sales tables. Some were behind the table, if you knew who was selling what. But all through the 1980's and early 1990's the supply of these bottles seem to diminish and the prices continued to rise. Of course there has always been another way of acquiring these old whiskies. Go out and dig them up!! In John Thomas' book, Whiskey Bottles Of The Old West, he indicates how hard it is for the average collector/digger to find these older style whiskey bottles. In a collection of several hundred bottles, he indicates that maybe one or two of the older style whiskies may be found. A collector/digger would be fortunate to find more than two or three of these older whiskies in a lifetime of digging. This statement is a bit dramatic. As time has gone on, it has been proven that trying to find the best bottles is a lot like catching fish or hunting mule deer. You have to be in the right place to find the trophy, but it also takes a lot of skill, patience and much hard work! There are people that love the challenge of finding the best or the most, so with research and hard work, dedicated diggers searched out the best locations for finding these early whiskies. Since most of these bottles were made and distributed from 1868-1885, towns that were populated during that time period were likely sites. It was soon discovered that some locations had better odds of having good bottles than others. Old mining towns had an excellent chance of having the type of bottles we were looking for. Farming communities not so much. Many of the early mining towns in Eastern California, Nevada and Utah were deserted or had become ghost towns. These old towns were dug hard in the 1960's and 1970's. When it became known that a certain town had yielded a top bottle, that town was worked hard by the dedicated group of ghosttowners. Unfortunately, the bottle dumps, trash layers, and privies in these towns were not a renewable resource. Unlike the best fishing streams, once a privy was probed out and dug, it was over. The bottles weren't coming back! Before too long the more obvious holes were all dug, soon most of the holes had been located. By the mid 1980's ghost town digging had nearly disappeared. In the early 1980's, the Federal Government also had decided to be much more active in enforcing the Antiquities Act of 1906. In the 1960's and 1970's ghost town bottle digging was a family pastime. A camping trip for bottle collectors and bottle clubs. After 1982 it was against the law! Private property permission digs became the best approach to digging bottles from the 1980's on. Sometimes major portions of the older sections of cities were razed for new construction. Many good bottles came from these projects. You had to be on the scene quickly or another digger would beat you to a hole. Diggers were armed with probes of various lengths and styles to get through the fill and rubble that may be covering the original ground level. Pounder probes to beat a probe hole in the ultra packed ground or asphalt. Concrete and asphalt were broken up so the potential privy could be probed. These "technical digs" were a crap shoot. Sometimes the cost of replacing the concrete/asphalt was much more than what was found, but there was always that chance of the big find! This type of digging is hard work. It took time to learn the techniques of finding and digging holes in this environment. Mostly it took super dedication and conditioning to work this hard looking for bottles. Of course the reward for a big find had multiplied greatly. A very nice rare whiskey bottle in 1969 might be worth 300.00, in 1996 it might be worth 10,000.00, or more. Armed with Sanborn maps, diggers kept a close watch on favored areas of older cities and towns. Getting permission from private property owners or home owners in the older parts of town became an art form. Most of the diggers of the 1980's to present are avid collectors. They are not working this hard looking for bottles to sell at the next bottle show. Most of these present day diggers/collectors are trying to find that particular bottle or bottles to add to their collections that are just not available any other way. If they are lucky enough, maybe they will find several examples of the same bottle in a privy. The duplicates could be sold or traded for something else of interest. Isn't this a great hobby!! I wish it were that easy! Keeping the focus on glob whiskey bottles again, 1996-2000 seemed to be the "great coming of age" time for western whiskey bottle collectors. I guess glob top whiskies could jokingly be called an "investment" during this period. Dealers and collectors were buying bottles and selling them quickly at huge profits. Interest was at an all time high in these bottles. Like we've seen in stocks, rare coins, real estate, etc., a bubble formed. Prices on some fairly common bottles had reached levels that just couldn't be supported. Quite a number of the more rare bottles topped the 10,000.00 mark. Some longtime collectors stepped back from the escalating prices and liquidated their collections. Four or five major collections hit the western bottle scene at the same time. Where there had been real shortage of available bottles for collectors to consider, all of a sudden there were several examples of almost every popular bottle for sale. The obvious happened, more supply than demand, and prices came down to a more realistic level. Another interesting thing that happens during these bubbles or rapidly increasing prices is that grading standards drop off. Collectors seem to be happy with anything, and pay increasingly high prices for bottles that have problems. These examples suffer the most when trying to sell them into a soft market. As collectors became frustrated with the market, some what of a malaise had settled over the glob top whiskey scene. Of course not all glob top whiskies suffered in the weaker market. Draw your own conclusions.. bottles that were extremely rare/popular did not decline at all, they went up. With the very top 6 to 8 bottles, with the very few that changed hands since this period, they've brought increasing high prices. Some escalating by 25-50% from the previous sale of the same example which had occurred during the 1996-2000 boom. Most of the more common glob tops have steadily increased in price throughout the entire period. J.F. Cutter fifths(t-46) and J.H.Cutter(t-43) were both selling in the $75-$100 range in 1998. Try to find a nice one now of either for under $250. Jesse Moore (t-91) a $50 bottle in 1998 now around $175, or how about Teakettle(t-136). Probably could have picked up a real nice one in 1998 for $800-$900, an upper tier example is going to cost you north of $2000 these days. These are fairly common bottles, there must some collectors, new collectors, out there. 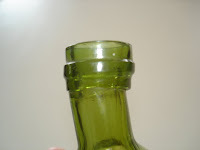 The bottles that suffered the most were some of the damaged or repaired examples that acquired during the boom. Also many of the mid range bottles, ie: McKennas, Phoenix, etc. were cut down noticeably in price. The McKennas is a great example. Very popular bottle, there are many nice examples around in some great colors. In 1997-98, you could buy one at a show for $900 no problem. By the height of the boom 2000-2001, I saw several examples sell in the $2500 to $3500 range! Now they are back to $1800 to $2000 for a real nice one, closer to $1300 for an average one. So what is the moral to the story? The popularity of groups of bottles seem to rise and fall, and rise and fall, over the years I have seen this happen with western sodas, whiskies, bitters, medicines, pot lids, on and on. The secret is knowledge and persistence. Know what is rare, know what colors are really unusual in certain bottles. If you are buying bottles, perfect examples will always bring a premium price. Seriously damaged or repaired examples may be needed to fill a spot, but be careful on what you pay. Hey, these early glob whiskey fifths and flasks are crudely made, meant to be thrown away, dug out of the ground with metal tools, and we expect them to be pristine perfect! Not likely. Very minor damage or very minor ground stain does not have a real harmful effect on value. Glass making problems, "inmaking issues" are given a fairly wide latitude, if not extremely distracting or problematic. What will happen over time is the same that happens in all collectibles, the very top examples will be the best investment. Perfect, undamaged specimens that have not been overly cleaned will begin to sell at a large premium to comparable examples that have issues or "excuses". The Wormser Bros. flasks (tf-62, tf-63, tf-64) are early western glob flasks that are well known to collectors, at least the Wormser (tf-63) or Vertical Wormser is well known. The Wormser (tf-63) is probably the most common, most easily obtainable, of the western glob flasks. This is one of the larger, early western flasks. Widely distributed in California and Nevada, and also southern Oregon. Distribution dates on this bottle would be approx. 1868-1872. If I was to venture a guess on a population total of this bottle, I would put the number at 200+. With that many examples floating around, it means you can find a decent example in the $350-500 price range. The typical "character flaws" of this flask are lack of crudeness in the body, weak embossing, and the typical color of this flask is quite an ordinary dark olive amber. So, if you want an example that is whittled, with strong embossing, and in a lighter color, the price just went up! There are several variations of this particular Wormser flask. If you are a "variant nut" like some of us are, then you will find it enjoyable to try to obtain the different examples. Hey, with the high prices, all I can afford are Wormser variations. I am not going to turn this into a exercise in minutiae much like collecting early U.S. coins, did you know there are about 50 varieties of the 1804 half cent!!?? I will consider embossing variations, major mold changes, and in the case of flasks, the type of top will be considered a variety. The Wormser(tf-63) comes in three variations of the top. What is considered the earliest example has a large double roll top, with the top roll noticeably larger than the bottom roll. 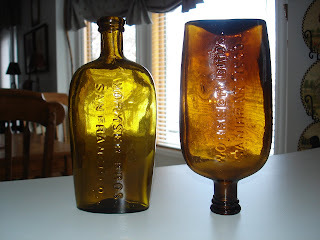 These large top examples were once thought to have been blown at the South Stoddard Glass works (see Wilson, Spirits of). I am quite certain that all of the examples of the Wormser Flasks were blown in San Francisco. Also, there is really no documented indication that this style of top is older or blown earlier than the other two (tf-63) variations. It's just more popular. In my observation of this variant, it seems like it usually comes with fairly weak embossing. Try to locate one with strong embossing and with decent whittle effect. They are not that easy to come by. Second variation would be the double roll top that is uniform in size, top roll to bottom roll. These seem to show up more often with stronger embossing, and I have seen this variety more often in lighter shades of orange amber and yellow amber compared to the 1st variant. Again, not that often in a highly whittled state. If you can locate one that is whittled and in color, you've got a nice example. Third variation would be the single roll top. I have not seen all that many of this style over the years. I have owned two or three and have seen a handful in other collections. One nice whittled example of a single roll (tf-63) came out of a privy in Pioche, NV in 1970's, along with some other nice early bottles. All of the early single roll examples I have seen have been in the same medium to dark olive amber coloration, and I have no documented reason to think they were blown before or after the other two variations. Except for some interesting finds that were made in Ruby Hill, NV. Digging that area in the early 1990's, before mining started up again in earnest, produced two, maybe three examples of Wormser(tf-63) flasks with a very small, pinched single roll top. They were not remarkable in any way except for the squirrelly top and that they were more of a plain amber color. The problem with these latest single roll finds is that they were found in late 1870's/early 1880's holes. Other bottles in the privies, Mau sodas, Schneider Drugs, amber beers - not black glass, etc., all point to a time capsule of from 1878-1882. Which corresponds with the boom years of Ruby Hill. So, the question begs, why are Wormser flasks being used in this town a full 6 to 10 years after Isaac and Simon Wormser sold the company. It probably has something to do with another change in the partnership that had originally bought out the Wormser Bros. in 1872. (see Thomas pg. 122 Whiskey Bottles of the Old West) It is interesting that they would still have access to the old Wormser Bros. bottle mold, and trotted out the old familiar embossed bottle years later. We will just include these newer single roll tops with the originals to avoid too much to think about. Glass manufacture in west changed rapidly in the formative years. 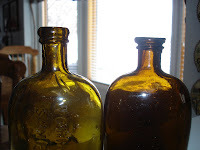 In the 1860's and early 1870's quality control of glass color for western blown bottles in practically nonexistent. It is not unusual to find early western fifths and flasks, 1867-1874 or so, in a surprising array of colors. From dark amber to apple green, and almost all combinations in between. Even a couple of examples are known in aqua glass. By the later 1870's to 1880's, the amber coloration became more standard. The ambers varied more simply light to dark, and not so much with olive tones. To the trained eye, these newer single roll Wormser flasks look quite different from the ones of pre-1872. The Wormser (tf-62) flask is the earliest version of WORMSER BROS. SAN FRANCISCO flask. It is sometimes referred to as the horizontal Wormsers or even the "fat Wormsers". It is an awkward, somewhat unwieldy shape, being quite a bit wider through the shoulders than the (tf-63) flask. These are crudely made bottles, and most likely didn't stand up too well when full of liquid. Possibly the reason they were replaced after a year or two by a more conventional shape. This is the first embossed whiskey flask blown on the West Coast. Circa: 1867-1868. It has been given an earlier date in some publications, but since Wormser's trade marked their "Golden Sheaf Whiskey" in 1867, that is the date I will use for the bottle. It is definitely found in towns that were active in 1868. At least ten broken ones and one intact one have been found in Eastern Nevada. A beautiful green example was recently found, broken in place, in Austin, Nev. This bottle would have to be rated very rare, possibly 10-12 intact examples known to exist. The Wormser(tf-62) is plagued with small checks and crack s in the glass due to improper annealing at the glass works. Every example known with either the single roll top or the double roll top have these "in making" annealing cracks. There are three examples known with what has been called a "champagne top". This top is very similar to the eastern blown pictorial flasks of the 1850's -1860's. The champagne top examples of the Wormser(tf-62) do not seem to have the annealing problems of the other two styles. I have seen two of the three examples and they appear to be perfect. I am not sure about the third example. With the distinctly different styles of top, I guess we have three variants of the Wormser(tf-62). Probably no need to worry about collecting all three, as they are nearly impossible to locate. I have seen just a couple for sale in the open market in the past 10years. One, yellow amber, with major damage was offered in 1999 for $2000.00, and in 2006 a beautiful yellow olive, perfect example with the champagne top was sold through Glassworks Auction. It fetched a stunning $26000.00 at auction. That was before auction fees were added! Most collectors rank the Wormser(tf-62) in the top five of the early western flasks. If we are going by dollar value, or "checkbook ranking", it would have to be ranked at #2. Only the N. Grange flask has sold for a higher price. The WORMSER BROS. S.F. / FINE OLD COGNAC(tf-64) is another of the extremely rare western glob top flasks, and the final of the three Wormser entries. This bottle was probably distributed for a short time in 1871-1872. There are at least 5, maybe 6 known examples. It is a smaller flask than the other Wormser's, slightly larger than a 1/2 pint. It comes only with a double roll top, and is a fairly heavy, sturdy "banded" style flask. The examples I have seen are similar in color, lighter amber shades with a slight olive tone. It is noted in Thomas' book that a broken pint example of this flask has been found. If anyone has first hand knowledge of that being a fact, please let me know. These flasks have been found in California and Nevada. I found a broken one in the old railroad town of Toano, in eastern Nevada. Putting an estimated value on this bottle is difficult, because there have been very few recorded sales. A very nice example sold at auction in 1996 for $10,000.00. Two more examples were found in 1997 and sold privately, reportedly for similar amounts. See my posting on "whiskey collecting".